The Dinner Party highlights the creative work that women have long made a part of their daily lives but that has not been recognized as art within the Western art historical tradition. Handwork—embroidery, tatting, including the process of lace draping, and china painting—plays significant roles in the artwork. As a part of her research, Judy Chicago sought the expertise of women who were keeping these traditions alive. 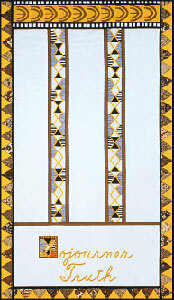 The table runners, banners, and table corners consist of finely executed embroidery and other handwork, and the table-runner styles often correspond to the time period in which the woman lived. In this Encounter students will consider the way in which The Dinner Party honors the textile and ceramics traditions. Students are introduced to textile traditions and are asked to consider examples of handwork over time. Students make general comments, ask questions about changes, and offer possible historical explanations. Finally, they engage in research to address their queries. To view the entire Encounter, download the PDF for Encounter 13: Passing On and Disrupting Traditions by clicking on the buttons below.